This article featured the entire schedule for Randy Santel’s 2017 Australia Tour which he continually updated throughout the trip so that everyone could follow along and know when, where, and what time all of his food challenges were. 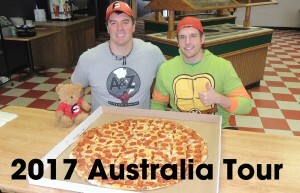 From May 25th through August 5th in 2017, “Magic Mitch” Dombrowski and Randy Santel attempted food challenges all around Australia, Singapore, and New Zealand. They started the trip by doing challenges around Chicago, Illinois, and then finished off with a few challenges around San Francisco and San Jose in California. The trip is now over but the itinerary remains for everyone who is interested in seeing where they visited during the trip. The videos will begin posting eventually and Randy will add the links as they continue uploading on to the Randy Santel YouTube Channel. Be sure to follow Magic Mitch’s YouTube Channel to watch all of his challenges too. Thank you for checking out Randy & Mitch’s 2017 Australia Tour Schedule! !